The Latrun junction at Route 1, just 30 minutes from Tel-Aviv or Jerusalem, offers the visitor a number of interesting sights to explore—a great addition to your itinerary for your trip to Isreal. So today, we’ll visit a military museum and war memorial, a monastery and an important archaeological site. It’s also a good day for a picnic, so let’s pack some sandwiches and hit the road. We’ll pick up the refreshments later. 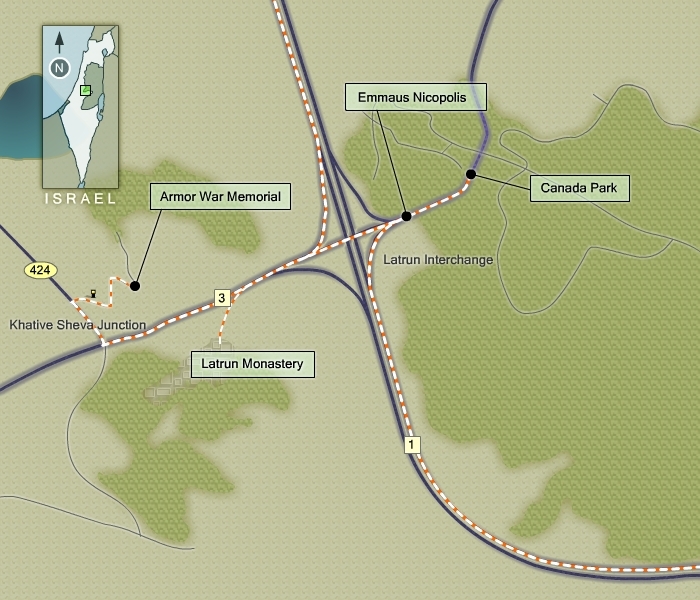 Latrun is located in the Ayalon Valley, which has significant strategic, biblical and historical significance. It is here that the sun and moon stood still while Joshua Ben Nun battled the Amorites, where King David fought the Philistines, and Judah Maccabee defeated the Seleucids. The Ayalon Valley is also where the Roman Empire’s Fifth Legion encamped during its siege of Jerusalem. Later, Arab, Crusader and Mameluke armies conquered the valley, and in 1917 it saw decisive battles between the Australian battalion of the British Army and Ottoman forces. It has been said that whoever controlled Latrun, controlled the road to Jerusalem. For this reason, the Ayalon Valley, and Latrun specifically, became an important battlefront for Israel’s quest for independence and again in 1967 during the Six-Day War. Today, as you travel in Israel, especially between Tel-Aviv and Jerusalem, you can’t help but enjoy the vista that the Ayalon Valley provides. Our first stop during today’s Israel tour will be the armor war memorial in the old British police fortress, where you will find a large array of tanks, half trucks and other armored vehicles. Many of these are of World War II vintage, others have seen battle during the Suez crisis in 1956, the 1967 and 1973 wars, and most interestingly, some Soviet armor from Arab armies captured by the Israeli armed forces. The site also includes an amphitheater where military ceremonies and memorials are held. The police fortress was built by the British government in 1940 for purposes of self-defense and because of its strategic location, as a base to operate forces in the region. The British army evacuated the fortress on May 14, 1948 and four days thereafter the Jordanian Legion took control of it, blocking the road to Jerusalem. Israeli forces attempted to capture the Latrun fortress in five separate unsuccessful attacks in an effort to lift the siege entrapping the 100,000 residents of Jerusalem. These bloody battles cost the lives of 142 Jewish soldiers whose names are engraved on Latrun’s wall of names, along with fallen soldiers from other wars and recent victims of terror. Computers inside the museum provide additional information on the lives of the soldiers, some of whom had arrived just days before on immigrant ships from Europe to fight at Latrun. It was only during the Six Day War that the Israel Defense Forces were able to capture the fortress. Existing bullet holes and bomb craters in its walls are clear evidence of the ferociousness of this battle. While visiting the memorial you have no doubt admired the beautiful monastery across the road. 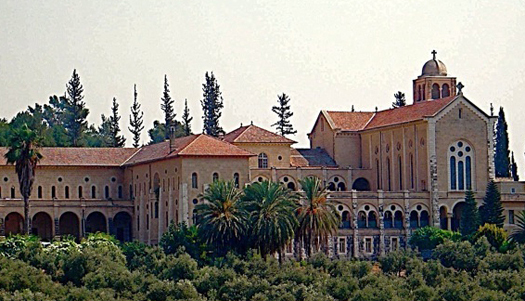 The Latrun Monastery, also known as the Monastery of the Silent Monks, has gardens and a church that is open to the public (Summer: 8:30-12:00, 15:30 -17:00 and Winter 8:30-11:00, 14:30-16:00). You may want to schedule your visit to the Monastery to coincide with one of the Saturday concerts, which are held inside the church ( 08-922-0065). As you wander through the church note its stained glass windows with their geometric patterns and the unadorned vaulted ceiling supported by seven white stone arches. If your visit to the Monastery is not on a day of a concert, your visit may probably be a short one, perhaps long enough to stroll through the gardens to admire some of the archaeological artifacts or purchase in the gift shop a bottle of wine or some olive oil harvested from the adjacent groves. The Monks are Trappists, part of the Catholic Church’s Benedictine Order, which was established in Italy in the 6th century. Abbott Paul Saouma is the driving force behind the winery and has been living at Latrun since 1945. Unfortunately, the winery itself, which is a maze of chambers, halls and cloisters, is not open to the public. The monastery has over 400 dunams of vineyards on its grounds which are accessible by car on a dirt road as you exit to the left from the driveway. Today the winery produces about 300,000 bottles annually including many varieties of Cabernet Sauvignon, Merlot, Pinot Noir and Blanc. Now that your appetite has been wetted its time to stroll through the wine shop to pick out your favorite selection. But before departing the monastery be sure to stop at the “Garden of Brotherhood” near the parking lot to admire the large wooden carving with its inscriptions, which is not unlike a totem pole. Returning to the main road we turn right following the signs to Modi’in. Drive under the viaduct of Route 1 to Canada Park where you can now enjoy your wine and picnic lunch. Canada Park has numerous hiking and walking trails, as well as a very well paved road on the east side which snakes through the mountainous forest planted by KKL/ JNF. During the winter months you can also explore it’s springs and water channels. 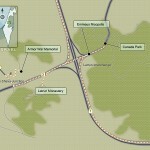 After your visit, backtrack about half a kilometer to the entrance to Emmaus Nicopolis, a must-see site for those of you participating in holyland travel. Most drivers proceeding down the Tel -Aviv Jerusalem highway (Route 1) fail to notice the impressive ruins of two basilicas nestled between the evergreen trees and typically organized tours to Israel don’t include this stop on thier itineraries. During the Byzantine period, Emmaus Nicopolis was established as an Episcopal See, with two basilicas being built at the presumed place of Christ’s meeting with his disciples. Subsequent Persian and Arab invasions destroyed the basilicas, but they again were rebuilt by the Crusaders in the 12th century. 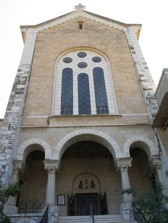 With the conquest of the Crusaders, the Christian presence at the site disappeared, and it was not until 1878 that the Carmelite Convent of Bethlehem acquired Emmaus Nicopolis. Subsequently, the site became an important place of pilgrimage and in 1993 its care was entrusted to the community of the Beatitudes. The significance of Emmaus Nicopolis to Christianity lies in the Gospel according to Luke, Ch 24, and verses 13-35. Two of them went that same day to a village called Emmaus, which was from Jerusalem about 160 stadia. And they talked together of all these things that had happened. And it came to pass that while they communed together and……Jesus himself drew near, and went with them. But their eyes were holden that they should not know him……and it came to pass, as he sat at meat with them, he took bread, and blessed it, and break, and gave to them. And their eyes were opened, and they knew him; and he vanished out of their site. As you enter the front gate of Emmaus Nicopolis note the long and beautifully preserved basilica. This is a remnant of the Crusader church that was constructed upon the remains of the Byzantine basilica, which itself was apparently built over a Roman house. Below that strata archaeologists believe that they have discovered a layer dating back to the reign of King Herod. To it’s right is the southern apse with a reliquary niche, while to the left is the baptistery chapel with a well-preserved baptistery font in the shape of a cross. Scattered around the site are remains of mosaics some of which include Greek inscriptions as well as an area of ancient tombs. Ossuaries (limestone bone boxes) found in some of these tombs attest to a Jewish presence at Emmaus during the Herodian period. You can also visit the museum on the hill which was built in the 1930s that today houses some of the finest mosaics excavated from the site, a wonderful collection of early 20th century black and white photos and an excellent array of artifacts, maps and detailed descriptions of important historical periods. In antiquity the site was noted as a place of delicious waters, a pleasant oasis. The name EMMAUS derives from the Hebrew word Hammot, meaning hot sources or springs. In the 3rd century the city was given the new name Nicopolis, city of victory, in Greek. Though hot springs are not visible at the site, you will recall, that the adjacent area, which is today Canada Park, has active springs flowing to this day. This concludes your Israel tour of Latrun and Emmaus Nicopolis and you can now easily return to Route 1 for the drive to Jerusalem or Tel-Aviv. There is a podcast available for this post. To listen to it now click this link. If you would like to download it, right click the link and select the appropriate dowload option.